PredaLure is a pheromone lure that attracts beneficial insects to your crops and gardens to feed on destructive insect pests. PredaLure has these benefits. California Certified Organic Farmers (CCOF) approved. After several years of intensive university research PredaLure was developed to help growers control a number of crop destructive insect pests. 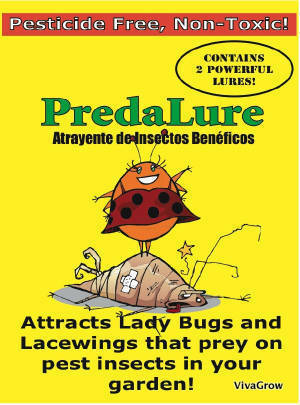 PredaLure attracts beneficial predatory insects such as lacewings (Chrysopa), lady beetles (Coccinella), various syrphids (flower or hover flies), Orius, Geocoris, Phytoseiulus, Stethorus and other beneficials attracted to the area of the active volatile. Many research reports from U.S. and Europe on the attractant in PredaLure . 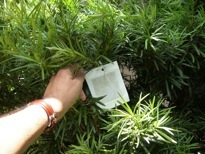 PredaLure Use in High Tunnels with Beneficial Insect Release or Naturally Occurring Beneficials. From the journal of Biological Control, Ingwell, et.al. 2018. Tailoring Insect Biocontrol for High Tunnels. Encapsulated in a controlled release packet, the propietary membrane releases effective rates of the attractant for several weeks. In an orchard, field crop, nursery, place PredaLure dispenser at crop height equidistant from each other or in "hot spots" where control is needed. Rates depend on crop and environment. In greenhouse it is reported that lady beetles do not leave, but stay to feed on aphids. Lacewing - Larvae of lacewings are generalist predators and attack almost any soft-bodied insect such as aphids, mites, whiteflies, mealybugs, thrips, scale crawlers, caterpillars, psyllids and eggs of all. Larva can kill 30-50 aphids per day. Lady Beetle - Aggressive predator of aphids, mites, scale crawlers, caterpillar and beetle eggs and larvae, particularly Colorado potato beetle. Syrphids - (Flower or Hover flies) Adult flies feed on pollen and nectar, whereas larvae feed on all soft-bodied insects. Larvae can consume 200-800 aphids in a 7-10 day period. They play an important role in suppressing populations of phytophagous insects. Orius - Minute Pirate Bug. A generalist predator in many crops, ornamentals, and landscape. Adults and nymphs feed on small insects and eggs of aphids, mites, psyllids, thrips, whiteflies, and small caterpillars. Phytoseiulus - A predatory mite that feeds exclusively on spider mites. Can devour several dozen mite eggs in a day and two to three adults.